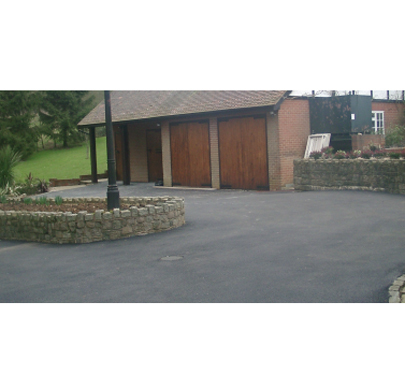 This private residence in rural Kent required an asphalt surfacing material for its large private driveway and parking area. The site was situated at the bottom of a sloped access road and had a narrow entrance. As such it required a material that would be durable enough to cope with vehicles reversing and turning within this tight access space. Bardon Prodrive Plus was installed on top of a 20DBM binder course. The full scope of works also included treating the brick/concrete foundation layer by using Type 1 to level the surface in areas where it was uneven. The asphalt material was chosen by the client after the contractor had advised that it was the best option to meet the demands required by the site - a tough, resilient surface course specifically designed for domestic vehicle applications.